History tourism in Savannah, Georgia USA comes to life in this exclusive blog post, “History at Our Doorsteps“, by photographer and historian James Byous (JByousCompany.com). Jim Byous points to mapped Savannah historical places in his engaging storyteller’s narrative. The scholar outlines the close proximity of the restored historic homes of Romantic Inns of Savannah to American Revolutionary battlegrounds and Civil War historical places in Savannah, Georgia. When you plan your up close and personal visit in Savannah, we hope you will book your lodging stay with Romantic Inns in Savannah — the small, privately owned lodging inns located within the story-rich National Landmark Historic District. Being here is sometimes like being there — back there in time — that is if you are one of the many folks who say they can feel history. Feeling history is hard to explain to those who unconsciously skip across the surface of the nebulous bouillabaisse of antiquity. Those of us who don’t or can’t or won’t find it pleasurable. Take any route through the city and some small morsel from the consommé, here or there, will reward you for your trudging onward. It was late 1778, Christmas had arrived. Glasses had been raised, gifts exchanged and tension filled the air. Patriots in the city of Savannah awaited an invasion by the British. Four days after their celebrations the Redcoats arrived. The city knew they were coming, still the American Patriots in Savannah were unprepared. Fortifications had been constructed around a portion of the city a few months before but they were poorly designed and contained gaps that made them unpractical. Less than two miles to the east near the current site of Savannah Golf Club, British soldiers stepped from their ships then trudged and slogged their way through rice fields, swamps and marsh to the southeastern edge of the city. Among the British units were American Loyalists, Scottish Highlanders and Hessian mercenaries. The Americans responded and met them a short distance outside of the city along what is now called Wheaton Street. The fight began. Unknown to the Patriots a portion of the British army had circled to the south of the city. Out maneuvered, then routed they fled westward. As they scurried from square to square the city British soldiers bayoneted the Americans they could catch then drove the survivors to the west. On the outskirts of the town they were forced to cross Musgrove Creek. Many drowned as they attempted to swim to the opposite shore, others were shot in the water. For expediency’s sake the next year the British destroyed the improvised American earthworks and rebuilt closer to the town to lessen the length of line should the enemy attack. Only two indicators are left today, ink stains on paper that were recorded by British Engineers and a shallow depression on the northern edge of Colonial Park Cemetery where the dry moat was once located. They show the 1780 route around and through the downtown area that comprised the city at that time. On today’s map the line of the works run south from Factors Walk to Oglethorpe Street then west to Jefferson and from there back to the river.The British settled in, reinforced the fortifications and celebrated their success. A major blow to the American cause, the next year Continental and French troops moved into the area to reclaim the city. The British had quickly revamped the Patriots’ works to strengthened and enclose the town. Patriot and French forces surrounded the city in September 1779 and for one month laid siege on the city in an attempt to reclaim the land. In mid-October iron and lead rained down inside and outside of the fortification line around the city. From the river French ships fired from the northeast. 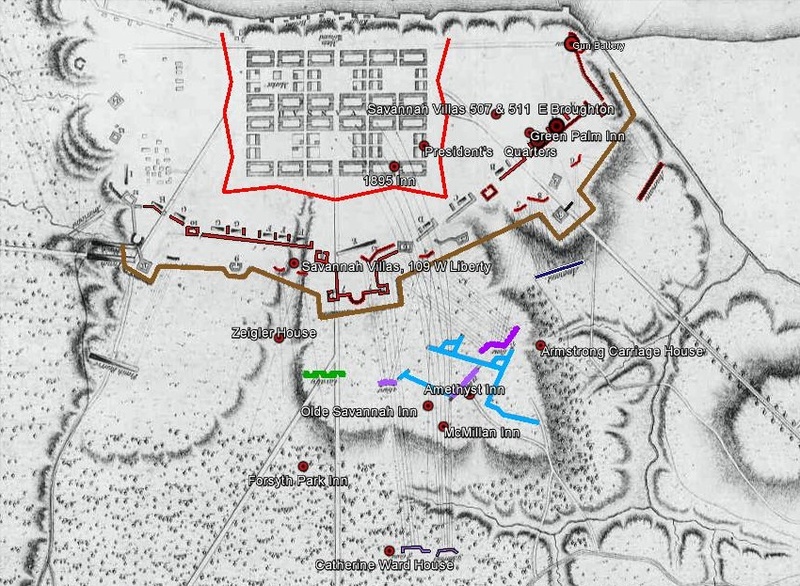 Feigning an attack on the eastern lines the Americans and French forces made the main assault on the west. The British were prepared and held the lines having learned rebel plans from a turncoat. British losses were few. Continentals and their allied forces suffered. The British lines held. It was one of the worst defeats of the war. With this in mind it is a treat, though not surprising, that all of the member establishments of Romantic Inns of Savannah now lay within a few hundred yards of the locations of the now-leveled and covered battlements. Green Palm Inn; British 1779 earthworks, 30 yards southeast, across the street. Presidents’ Quarters Inn; British 1780 earthworks, 60 yards east, one block away. 1895 Inn; British 1780 earthworks, 70 yards south, at the south side of Oglethorpe Street. Zeigler House Inn; British 1779 abatis* line, 160 yards northeast, American Cavalry unit 150 yards southeast where the Mercer/Williams house now stands. – 109 West Liberty Street, British cannon batteries 30 yards west, 25 yards south and the main earthworks were located 40 yards north, across the street. – 507 and 511 East Broughton Street, 160 yards southeast to the 1779 works and 200 yards east to the 1780 earthen wall. Armstrong Inns and Carriage House; French cannons and trenches, 100 yards west and a Union Civil War line of earthworks 500 yards east. Amethyst Inn at Sarah’s Garden; French cannon battery, 30 yards northwest, French trenches 70 yards east. Olde Savannah Inn ;French trenches, 25 yards northeast, French cannons 120 yards northwest. Forsyth Park Inn; Enlisted Union soldiers’ prison, 30 yards south, across Hall Street from the front porch. McMillian Inn; French cannons and trenches, 103 yards north, French cannon battery 230 yards northeast. Catherine Ward House; French cannon battery 35 yards east, literally next door. 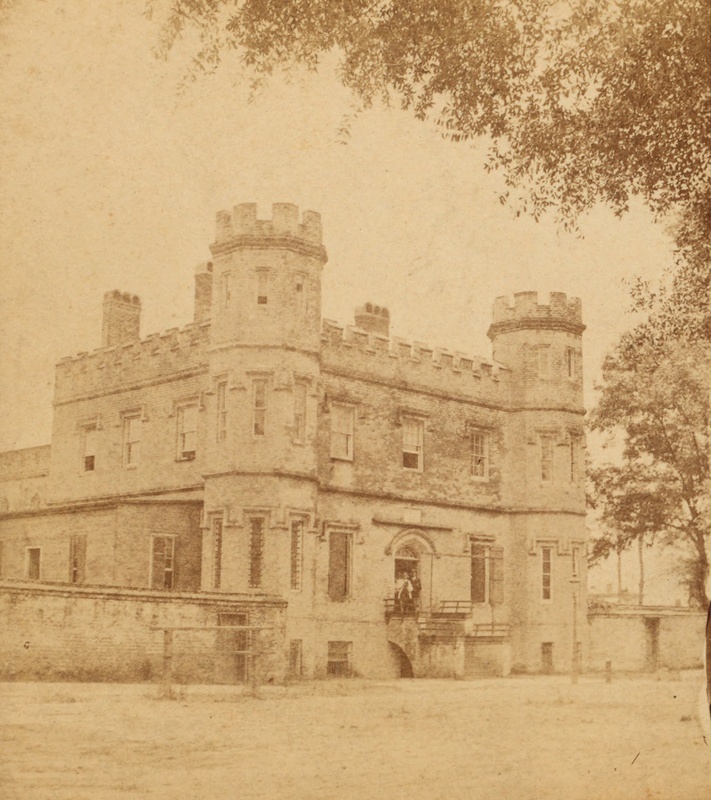 Chatham County Jail around the time of the Civil War. Photo by D.J. Ryan. The Romantic Inns in the Forsyth Park vicinity were not only on the battlefield in 1779 but have history from the American Civil War within a few yards. Union Soldiers were transferred to Savannah in 1864 shortly before General William T. Sherman’s advance on the city. Near the Forsyth Park vicinity of Whitaker and Hall Streets once stood a prison camp for the captured Union enlisted men. From the facility, about 30 yards north, across Hall Street, is the front porch of Forsyth Park Inn. Across the city history hides among the houses, trees and streets. Much has been lost over the years but much can be mapped and pinpointed. These fourteen examples show that in Savannah it is ever present that we have history at our doorsteps. * abatis line: A defensive obstacle made by laying felled trees on top of each other with branches, sometimes sharpened, facing the enemy. **Now former member, Huntingdon Whitaker Inn; Enlisted Union soldiers’ prison, 120 yards south. Copyright 2015, James Byous, J. Byous Company. May not be copied, replicated, or extracted in any form without the written permission of the author.